I have been slacking a bit on the Fast Food reviews. One problem is trying to eat healthier, and Subway doesn’t really release enough new items. 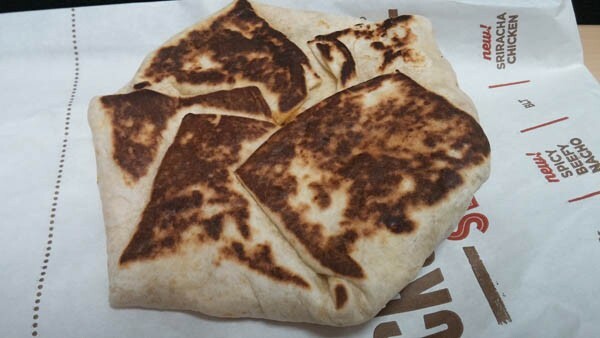 I ventured out into the Oregon rain and grabbed one of the new Taco Bell Spicy Beef Nacho Crunchwrap Sliders (the name is a mouthful, not unlike the actual item). This will be the only version I review. I did review the previous three sliders when they came out last year. You can see that review here. We have already mentioned that Taco Bell released this version, along with a Sriracha version. I don’t like the taste of Sriracha, and therefore probably couldn’t give an unbiased review, so I am abstaining. So on with the review! 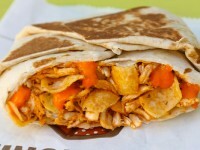 The Spicy Beef Nacho Crunchwrap Slider uses the regular seasoned beef, with chipotle sauce and nacho cheese sauce with Fritos chips for the crunch, all wrapped in a flour tortilla and grilled. They cost $1 now (however after the promo they will probably shoot up to $1.59, so grab then now). Overall, there isn’t anything incredibly spectacular about this new Slider. Sure, it tastes great, and if you like Taco Bell, you’ll love it, but there really isn’t anything new brought to the table in terms of flavor, texture, or combinations. 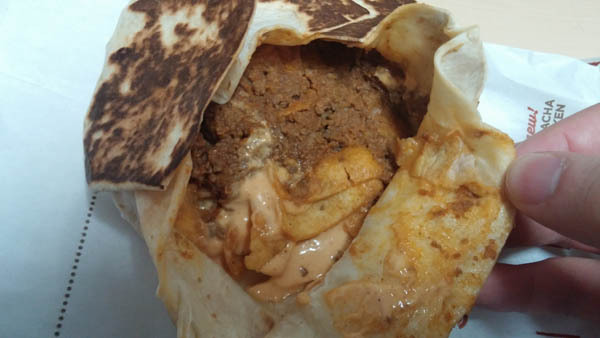 This is basically a Beefy Nacho Griller, or a Beefy Fritos Burrito (RIP), however the major addition is the spicy chipotle sauce. I am a huge fan of the spicy chipotle sauce that has been used on many Taco Bell items recently. 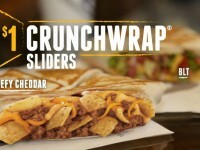 It does elevate this Crunchwrap Slider from completely boring to pretty good. 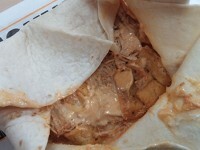 While it is good, I think the chipotle sauce works much better with the chicken instead of beef. One complaint I had was the uneven distribution of the items. Particularly the Fritos chips. In one bite, I would have a mouth full of Fritos, while in an other, there would be no crunch at all. I would prefer a much better distribution, which might have been just sloppiness in the construction, since that doesn’t typically happen to me at Taco Bell. 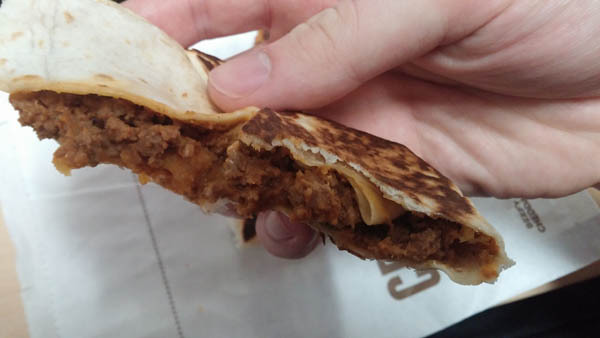 There wasn’t anything particular memorable about the Taco Bell Spicy Beef Nacho Crunchwrap Slider, but if you like Taco Bell, and like only spending $1, this should be right up your alley. (If you only had one dollar though, I’d go for the BLT version).